How to enable/disable Do Not Disturb from shell on Mavericks? I would like to toggle the Do Not Disturb in the notification center with a keyboard shortcut. I am using BetterTouchTool for some extra keyboard shortcuts but it does not support enabling/disabling the notifications in the default options. It has an option for executing a terminal command so I'm asking here how to enable/disable Do Not Disturb from the terminal? I found Schedule ‘Do Not Disturb’ In OS X Mountain Lion With Automator and I tried to run the commands but it didn't seem to work. Or if you definitely want it from the command line, an applescript to do this (assuming you setup the keyboard shortcut to use cmdshiftoptctrlD. 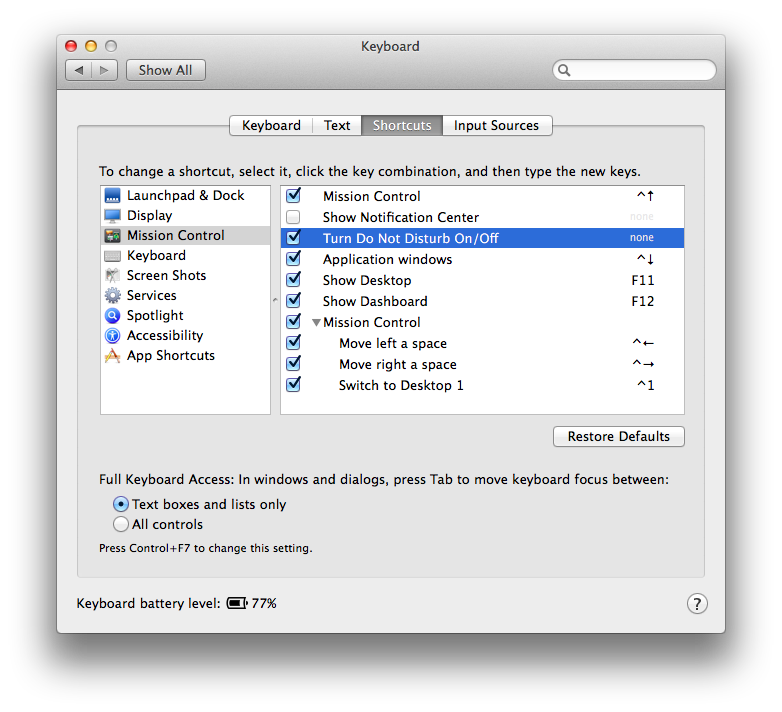 Note that you still MUST setup a keyboard command in System Preferences for this to work. Now you can run osascript ~/dnd.applescript from the command line to toggle your DND setting. Building on answers from James and Zsolt, I've created a couple of scripts to turn on or off (not toggle) DND state. They also don't require any key bindings or machine GUID to work. You can simplify the answer that razvanz provided by using the -currentHost argument to the defaults command. defaults -currentHost write ~/Library/Preferences/ByHost/com.apple.notificationcenterui doNotDisturbDate -date "`date -u +\"%Y-%m-%d %H:%M:%S +0000\"`"
echo "Do Not Disturb is enabled. Run $0 to turn it off (OS X will turn it off automatically tomorrow)." echo "Do Not Disturb is disabled. Run $0 to turn it on again." Not the answer you're looking for? Browse other questions tagged mavericks keyboard command-line do-not-disturb . How to enable/disable Do Not Disturb from shell on Mojave? Does Notification Center have keyboard shortcuts? Can I make “Do Not Disturb” permanent? Is there a keyboard shortcut to enable/disable hidden files in Finder?